Yet, the hard work doesn't end there. Son is faced with the tough task of battling back into the Tottenham team, with fellow winger Lucas Moura having excelled in his teammate's absence during the last three matches in the English Premier League. Moura's three goals — two of which came against Manchester United at Old Trafford — helped him win the Premier League player of the month award for August, and handed Tottenham manager Mauricio Pochettino something of a dilemma now Son is back. Does Moura's form give Pochettino the option of even giving Son a well-earned rest? After all, the winger has barely stopped since linking up with South Korea in late May for warm-up games ahead of the World Cup finals. 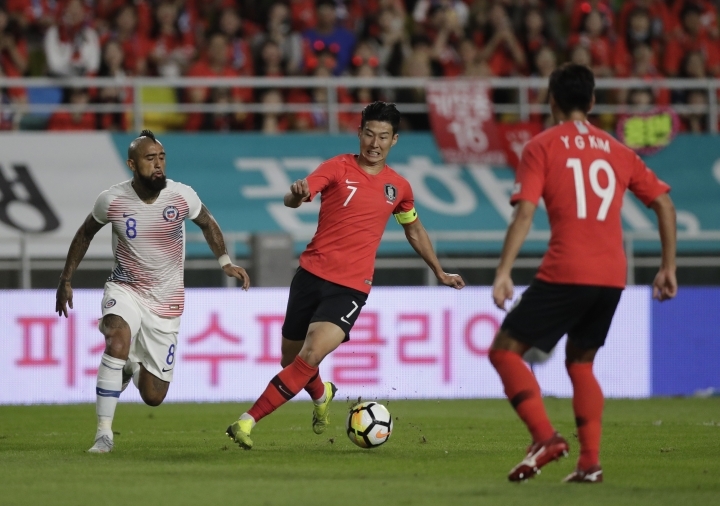 As if he hadn't played enough this summer, Son played almost every minute of the national team's friendly games against Costa Rica and Chile over the past few days. It seems the 26-year-old Son doesn't want that, though. "Fatigue is an excuse," Son said after the 0-0 draw with Chile on Tuesday. Tottenham's hectic upcoming schedule may require Pochettino to throw Son straight into action. A home game against Liverpool on Saturday starts a run of seven fixtures in 22 days across three competitions for the London club. That includes the start of the Champions League and it's hardly a slow introduction to the group stage: Spurs play Inter Milan and Barcelona in their first two matches. There's a chance Son will not start against Liverpool at Wembley Stadium — although the absence of Dele Alli because of a hamstring injury does leave an available spot in the forward line — but will return for the trip to Inter three days later. With Erik Lamela also providing competition in attack and both Alli and Christian Eriksen seemingly mainstays in Pochettino's team, Pochettino has never had such a wealth of options up front. Morata has one goal in his first five games of the season — after a preseason when he failed to score at all — and looked off the pace in Chelsea's most recent games, against Newcastle and Bournemouth. Either way, Morata's spot looks up for grabs as he struggles to prove worthy of the club-record fee of 58 million pounds (now $80 million) that Chelsea spent to sign him from Real Madrid in the offseason of 2017.